Street parking in the neighborhood is limited and difficult. Please use our patient parking garage as it is the same rate* as metered street parking. 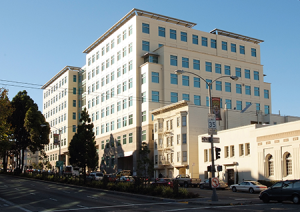 The closest patient parking garage is located at 2238 Geary Blvd. Entrance is on Geary Boulevard between Divisadero and Broderick Streets. Please take your parking ticket with you and pay at one of the pay stations before returning to your vehicle. Please validate your parking ticket at the reception desk when you register. This will allow you to pay a Kaiser Permanente member parking rate. Member: $1 per half hour, for the first 3 hours, $2 per half hour after that; $16 for the whole day.